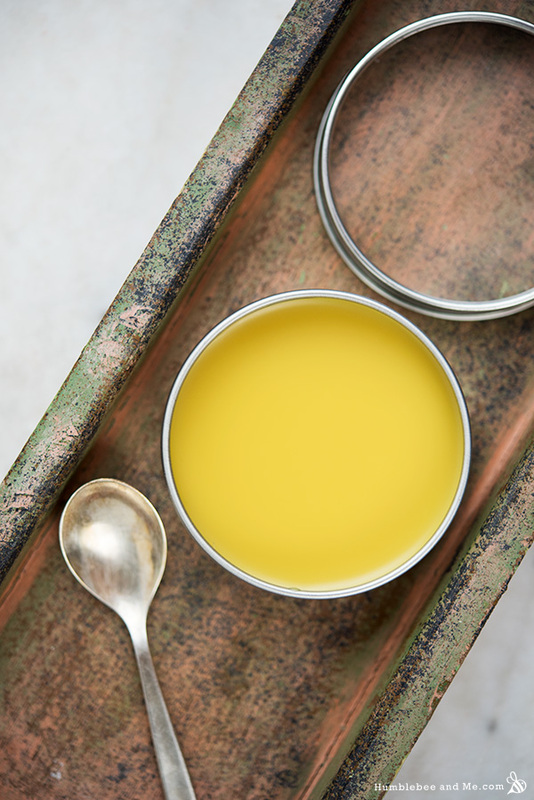 This juicy, honey-hued Orange Abyssinian Overnight Balm is utterly lovely. It has an almost unbelievable dry finish, leaving skin hydrated, but not greasy. It smells of pure, juicy oranges with the slightest hint of sweet, floral Tahitian gardenias. It’s smooth and rich, and it’s vegan. In short, it’s beautiful. I like using it on my face before bed on extra dry days—it’s brilliant for dry patches, and guarantees I’ll have sweet smelling dreams. Yum. 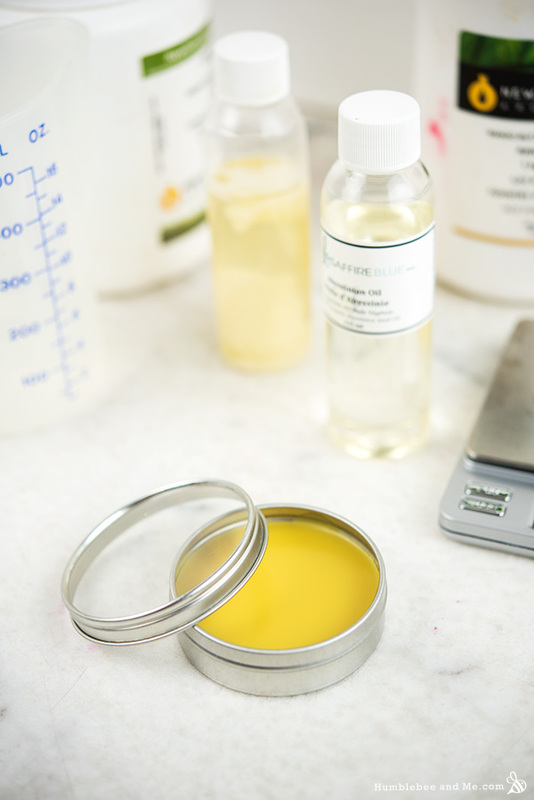 I was originally going to make this balm with argan oil as the star ingredient, but as I was rooting around in my absurdly overstocked ingredients cabinet, I stumbled across a mostly forgotten bottle of pale yellow abyssinian oil. I remembered reading that it was a great alternative for argan oil, so I thought I should pull it off its forlorn shelf and transform it into something lovely. Up next is some orange wax, which has a rather misleading name. It is orange, and from oranges, but nobody who is familiar with beeswax or candelilla wax would ever guess it’s a wax. It has the consistency of water; incredibly thin and not at all oily or tacky feeling. It absorbs into the skin in a flash, leaving nothing behind (except for, perhaps, a slight orange stain on the skin). It smells utterly delicious—I wouldn’t blame you if you were tempted to add it to a cocktail! It is photosensitizing, though, which is why this is an overnight balm. The other half of our scent blend is some luxurious Monoi de Tahiti. Monoi is coconut oil that’s been macerated with the petals of the Tahitian gardenia, giving us a beautifully fragrant oil that’ll leave you wondering where your bathing suit is. Blended with the orange wax it’s a beautiful, sweet undertone. Yum. 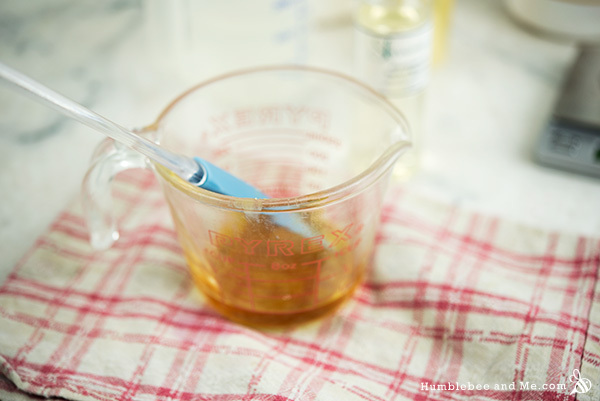 Prepare a water bath by bringing about 3cm/1″ of water to a bare simmer in a small saucepan. 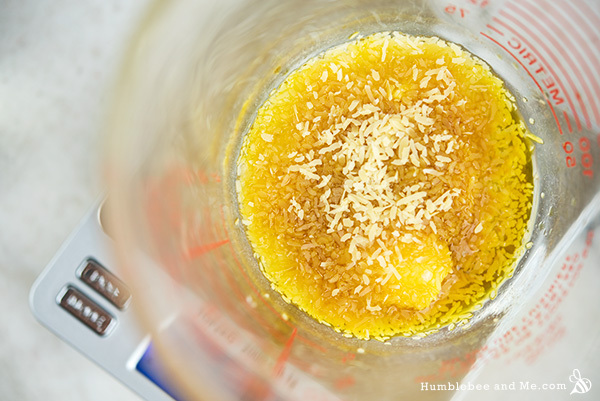 Weigh all of the ingredients into a small heat resistant glass measuring cup. 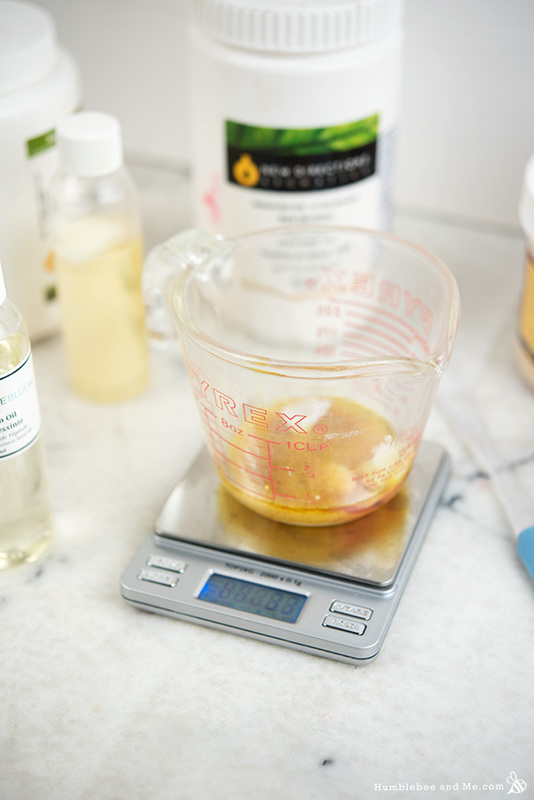 Place the measuring cup in the water bath to gently melt everything through; this will take 20–30 minutes thanks to the high melting point of candelilla wax. 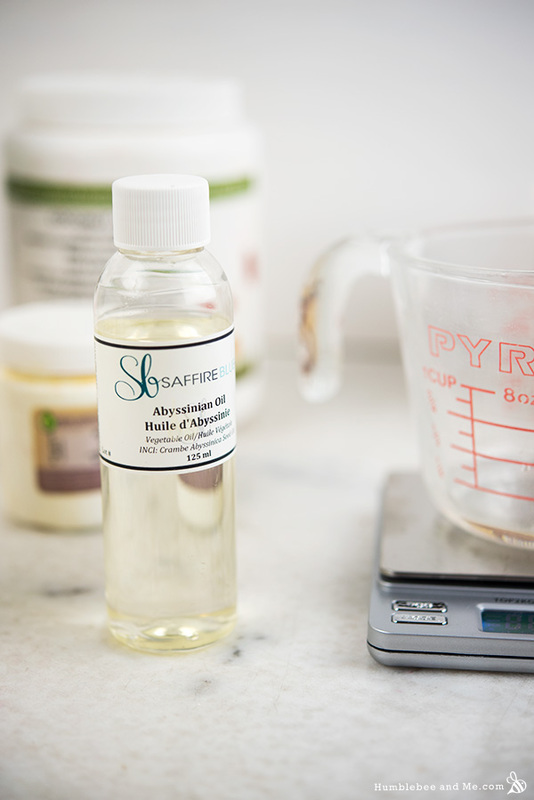 Once everything has melted through, give the mixture a stir with a flexible silicone spatula to combine, and decant it into a 45ml/1.5 oz jar or tin. Let it set up for 20 minutes until the jar is cool to the touch and the balm has started to pull away from the sides a wee bit. To use, smooth a small bit over your skin before bed. Due to the photosensitizing properties of orange wax this balm should not be worn out into the sun. Because this balm is 100% oil based it should last for at least a year. 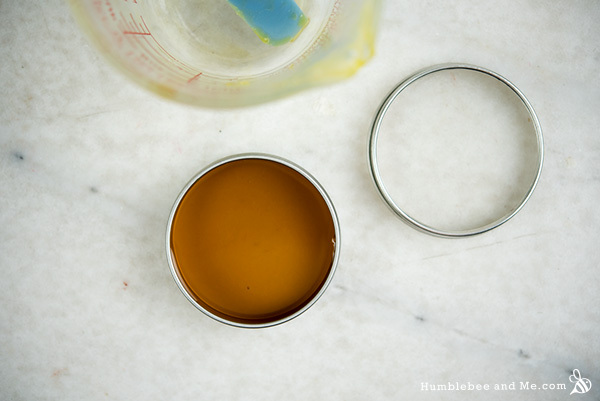 I don’t have all of the ingredients — what will be the product’s consistency if I substitute beeswax for candelilla wax? Can I substitute something else for orange wax? For more info, click on the link provided where Orange Wax is listed in the ingredient list. Bees Wax is softer than Candelilla wax so you will need a different amount than what is listed for Candelilla wax. 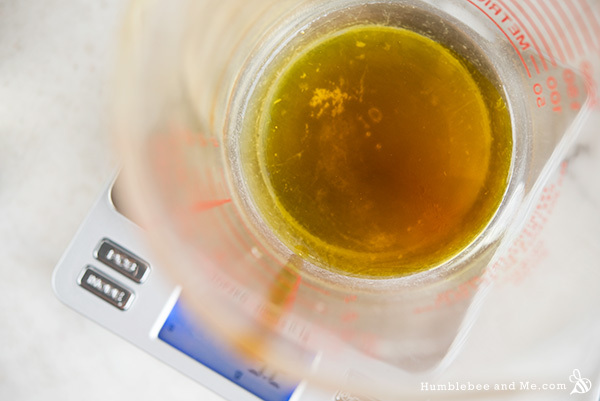 Click the link in the recipe next to the orange wax for an entire page on it, including substitution info 🙂 And check out this for info on beeswax vs. candelilla. Since it is a bit difficult to obtain orange wax and ab.oil in Europe I would like to substitute it for sweet orange eo and makadamia oil instead of abyssinian oil. What do you think, is it a good idea and how much orange eo would you put? Click the link in the recipe next to the orange wax for an entire page on it, including substitution info 🙂 Happy making! Wow, this sounds perfect for me. My skin is so dry that even in summer I’ve been wondering how to hydrate it. I wonder if any of these ingredients would activate my eczema? I already use your promise Afghan serum and that has helped. Thanks for sharing this! Thanks, Sheri! I’m afraid it’s impossible for me to even guess if this would activate your eczema as eczema can have so many different causes—that’s like asking if you might be allergic without me knowing anything about your allergies. You are definitely the best person to make that call 🙂 Thanks for reading and do let me know how it goes if you try it! The packaging is so cool! Is the lid clear? I like how you named this balm. Sounds very exotic and nourishing! I really love adding the Dr.Adorable’s range of waxes into balm etc. They smell all lovely! I love this but can’t find orange wax sold in the UK. As always, postage from North America is pretty steep. Is there any way to replace the orange wax? Or maybe a UK reader has found a source?! Thanks a lot! I too am having trouble finding orange wax here in New Zealand – none of the suppliers here stock it although one had lime wax?? Many of the overseas stockists won’t ship to New Zealand either or the shipping costs are horrendous. 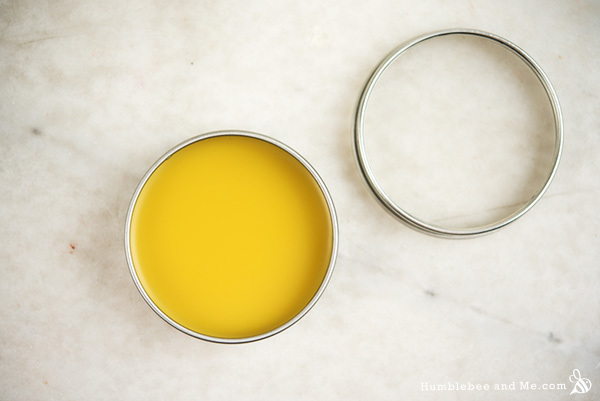 Is there a substitute for the Orange wax – this balm sounds gorgeous and I would love to try it. Thanks. I finally assembled all the ingredients, but I am concerned about the measurements. Do you measure all the ingredients in grams even tho some are solids and some are liquids? Hurry your answer please, as I already promised my sister and my friend some! Also, my Monoi de Tahitie came unscented, now what can I add for your fragrance? Yes, everything really is in grams haha, that is why the entire recipe is written in grams 😛 Both solids and liquids have mass, and that’s all that’s important here 😉 It makes for far less messes! If your monoi is unscented, it is, by definition, not monoi :/ It’s probably just refined coconut oil 🙁 I don’t know of any other natural way to get that scent, you could try looking at fragrance oils, but I’m not a huge fan of those as I find them to be far too strong and quite chemically. yes I tend to stay away from the fragrance oils myself. Thanks for the grams, I eventually bought a grams scale and did make it accordingly. I would like to know why the result were so hard? I know it goes on just great regardless! At the very small amounts it used, I will have that stuff for a long time. Now I know why such a small batch was made. Splitting it between two containers (one to share) would have been a better idea. I will make this one again with the correct monoi. Thanks ever so much for all the great recipes! I made it hard so it’s harder to over-apply 😉 I find people tend to really slather on softer body butters/salves and then come back and complain that it’s greasy—it’s hard to over-apply and feel greasy when the product is firm! I made the Orange Abyssinian Overnight Balm. The only sub I made was Argan oil for the Abyssinian. It came out quite solid. I have to either keep rubbing my finger over it to melt it to come out or kind of dig a little out. Is that normal? Maybe I mismeasured something. But it sure smells wonderful! Hey Kelly! It’s supposed to be relatively firm so it’s harder to over-apply 🙂 You can always use less wax in your next batch if you prefer a softer more salve-like product. Thanks Marie. Maybe next batch I will use a tad less wax. And I’m sure there will be a next batch! Love it. So glad I discovered your blog! Can’t wait for your book to come out! I thought the same thing until I just started to put it on. After a few minutes I saw why it had to be so hard, any other way it would have been too much. That stuff is amazing! To be honest I did not try it right away, because I thought it was just too hard. Last night I tried it and it was amazing. At first I didn’t feel like I was getting anything on my face at all. A few minutes later I could see where I put it and I LOVE it!!!! I made this the day before I left for vacation. Yes Marie, little world traveler you, I went on my own vacation and it was just what I’ve been needing. All three of us used this Balm on our hands, cuticles and elbows while traveling. We had the softest hands, cuticles and elbows wherever we went and we smelled darn good, too. 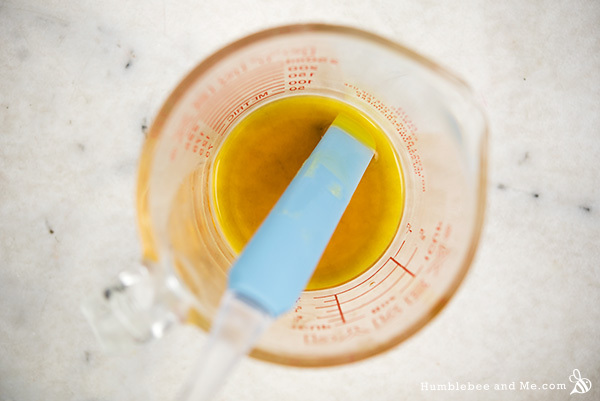 I bought my orange wax a long time ago because of you and am always thirsty for more recipes. Woohoo! I’m so glad you’re loving this stuff 🙂 I sent most of mine off to my Grandma, I hope she loves it as much as you do! My orange balm seems much more orange than yours. 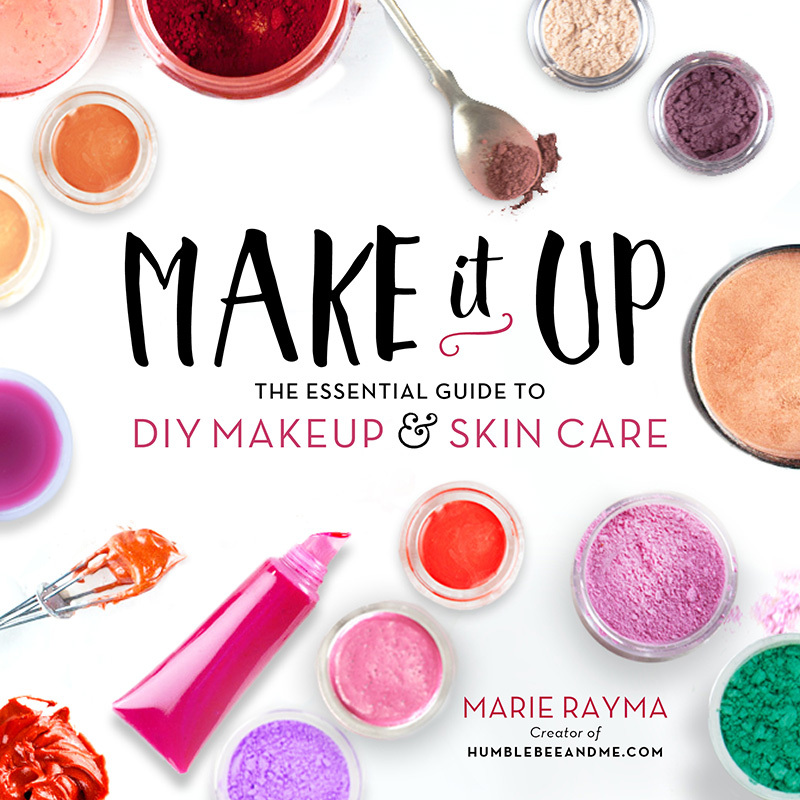 I used this recipe and my balm is very much oompah loompah on my face. Not to worry, as I just doubled the recipe without doubling the wax. I also made a 100gr lotion bar and added 2grs of wax and it looks more like the yellow your photos. I purchased mine from Dr Adorable. I know that natural product batches vary but mine is so much more yellow/orange! Hi Firegirl, what was your experience with Dr Addorable? The shop seems to exist only on Amazon and ebay. I am curious about this unrefined liquid orange wax. I finally made this balm! I had to you my refined orange wax, which still has a noticeable fragrance that is thankfully longer lasting than orange EO. My orange wax is thick though! As thick as peanut butter I ‘d say. I used passionfruit oil instead of abyssinian (a reluctant step away from GLA) and indeed the balm has a dry feel, goes into the skin quickly. I wish monoi fragrance wereally more present though- it probably got lost in the scent of passion fruit. Quite unusual for me not to use any EOS but the long-lasting scent is worth it. Great recipe!!! I also did another batch where I replaced candelilla wax with emulsifying wax NF (and used jojoba oil instead of abyssinian oil) plus 0,5% of menthol crystal and arrived to a cleansing balm, a kind of a hybrid of this and cold snap cleansing balm that is coming to an end…. will be trying it out tonight! Yay! Why has my lip balm/body butter gone grainy?